Yes, casino parties are legal. It's all in fun, with no "real" gambling involved. 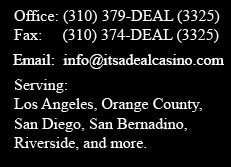 It's A Deal Casino Rentals is strictly an entertainment company and you are hiring us for casino night entertainment services. There is never any money exchanged at the tables. Your guests wager with casino chips and have a chance to win prizes based on their winnings. There is no monetary requirement for them to participate. For casino night fundraisers and charity poker tournaments be sure to check out our Casino Night Fundraiser page and/or the Casino Night Fundraiser Legal Downloads page regarding the legality of your fundraising event. When your guests arrive they are giving a certain amount of casino chips which they can exchange at any casino table for a smaller denomination of chips. They can play their favorite game or move from table to table throughout the evening. If the guests do not know how to play the game, are friendly dealers will be happy to explain it to them. 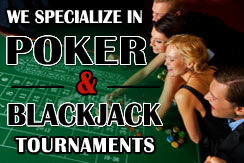 This ensures that everyone learns, has fun and experiences the festive casino night atmosphere. Do I need to provide prizes for the casino event? All of our pricing is based on 4 hours of continuous casino time. Additional hours are available for an additional cost. How much space and how many tables will I need for my event? If the casino is the only form of entertainment, we normally recommend 70 percent table coverage versus the number of guests. Example: If you have a guest list of a hundred you should have enough playing spots for 70 people at any given time. However, we will work with you to maximize the playing spots and still keep you within your budget. Keep in mind if you choose to have less than 70 percent coverage, some guests may have to wait to play or you may have to put some time limits on playing time so that all guests or get a chance to participate. If you have multiple forms of entertainment, we recommend 50 percent coverage. We do not want you paying for tables and dealers with no players. Please see our table pages for number of playing spots and square footage needed. When do you set up and tear down your casino equipment? Our team will work with you and the location for your casino party in order to determine the best time to set up. We will deliver everything and set up well before the start of your event to ensure your guess gets the full Casino Party Experience when they arrive. Tear down of equipment will begin within 30 minutes from the completion of the casino event, unless requested otherwise. A signed contract and deposit is required to hold your casino night reservation. Deposits are fully refundable if cancellation is received at least 10 days prior to your event. The balance is due the night of your event. For your convenience, we accept payment with atm, credit card, cash or check. If you are having a fundraiser, then additional casino chips can be purchased from the host for an additional donation. This will vary based upon how the fundraiser has been set up. Dealers do occasionally receive tips from players who have a fantastic time and want to show their appreciation monetarily. We don't allow “tip jars” on our tables nor do we solicit tips. Yes, we are fully licensed and insured. We can provide certificates upon request.